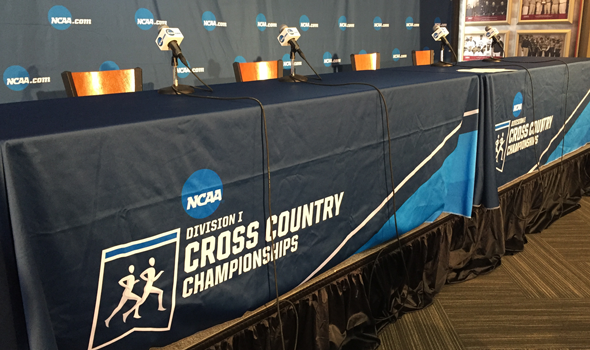 MADISON, Wis. – Even though all 10 of the participants at the NCAA Division I Cross Country Championships Pre-Meet Press Conference let their personalities shine throughout the afternoon, you could tell both through their demeanors and through their words that their focus is on the task at hand less than 24 hours later. The coaches on the dais – BYU’s Ed Eyestone, New Mexico’s Joe Franklin, Northern Arizona’s Michael Smith and Oregon’s Helen Lehman-Winters – want to make sure their athletes are as relaxed as possible to race just as they have throughout the season leading up to this point, which allowed their squads to be ranked No. 1 and No. 2 in their respective gender’s National Coaches’ Polls. Smith’s Lumberjacks and Eyestone’s Cougars are first and second in the Men’s National Coaches’ Poll, while Franklin’s Lady Lobos and Lehman-Winters’ Ducks sit No. 1 and No. 2 in the Women’s National Coaches’ Poll. Both Franklin and Smith know history is at stake. New Mexico could win a third title in four years, something that would hearken memories of Villanova’s women reeling off an astonishing six national titles in a row between 1989 and 1994 and/or Stanford’s women winning four in five years between 2003 and 2007. Northern Arizona could three-peat, something no NCAA DI men’s program has done since Arkansas from 1998 to 2000. Eyestone and Lehman-Winters direct those teams that have the best chance at derailing those dynasties, according to the National Coaches’ Polls. The plan for BYU’s men, Eyestone said, is to focus more on what its seven runners can do on the course, rather than paying attention to what the Lumberjacks are doing – something he said hurt them last year in Louisville, Kentucky. Then there are the Women of Oregon, with a roster that has only been together for 10 weeks now, but Lehman-Winters said they bought in from Day 1 when she took over the program. The athletes in attendance – Northern Arizona’s Matthew Baxter, Stanford’s Grant Fisher and Wisconsin’s Morgan McDonald for the men and Boise State’s Allie Ostrander, New Mexico’s Weini Kelati and Wisconsin’s Alicia Monson for the women – know it’s going to be a high-leverage situation from both an individual and team standpoint, but they’re ready for it. There is nothing that can happen tomorrow over the 6K and 10K tracts at the Thomas Zimmer Championship Cross Country Course that would shock any of those athletes (They even said running through snow would be fun, not an issue). All six have been in their share of championship bouts and stood tall after 12 rounds (Monson might be the new kid on the block, but proved she is a contender with wins at the Nuttycombe Wisconsin Invitational, the Big Ten Championships and at the Great Lakes Region Championships). Championship Saturday is finally here. Grab your popcorn.